Today I’m up to my ears in basement. We have a professional organizer turning a heavily packed and useless living space into a downstairs office and play area for us! (This will come in handy in the summertime!) Special bonus — got part of the garage cleared out, too! 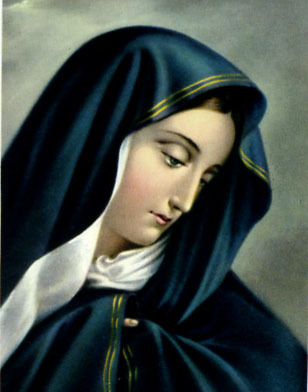 As divine Providence would have it, Sarah Reinhard posted a lovely reflection today at CE on waiting with her suffering child in the emergency room, on her helplessness to relieve little Babb’s suffering … and her realization that the Blessed Mother could especially relate to her suffering, from her own experiences during the final week in the life of Christ. This entry was posted in Weekend Ponderings and tagged Blessed Mother, suffering, Weekend Ponderings by heidihesssaxton. Bookmark the permalink. How many times have you moved homes/houses in your life? I’ve moved more than a dozen times since I left home … including twice overseas. However, my husband’s family has lived in the same town for four generations. So his stuff has really accumulated over the years!